Planks are a very effective exercise for strengthening the core (glutes, back, abdominals). Often shoulder weakness or injuries prevent proper body alignment. 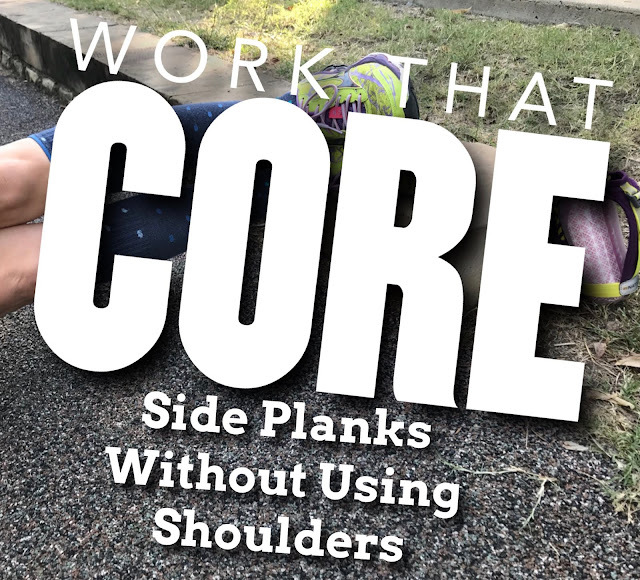 Check out this easy to use modification to perform side planks. Sometimes injuries or muscle weakness doesn’t allow side planks to be accurately executed and an effective exercise. Modifications to exercises are key to bypass the point of weakness. You can also address the injury or muscle weakness in addition to this exercise. Feet are elevated. Next, pull abs in & contract glutes to elevate hips. Lie on your side and place feet on an object around 12 inches to 24 inches. Optional, place padding under the side of your head to protect your face. Push through your feet to elevate hips. Contract glutes to prevent rolling backwards. Contract abs to prevent rolling forwards. You can do a variety of holds for this exercise. Option 1: Hold for 15 seconds. Repeat 3 repetitions. Option 2: Hold for 30 seconds. Repeat 3 repetitions. Option 3: Moving hips up and down for 10 repetitions. Repeat for 3 sets.